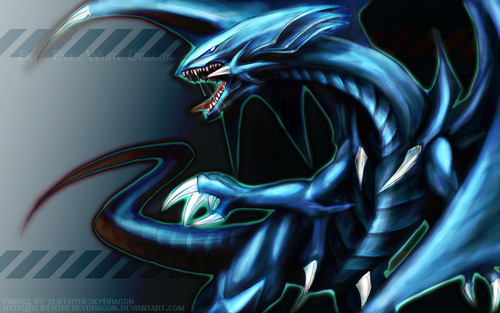 Blue Eyes White Dragon. . HD Wallpaper and background images in the Yu-Gi-Oh club tagged: yu-gi-oh yugioh kaiba. This Yu-Gi-Oh wallpaper might contain sardine pacifique, sardinops caerulea, and sardine du pacifique. Why is the 'white' dragon... blue? Just been wondering about that for a while. Kaiba used to have that monster in his deck at one point. are Kaiba use Blue Eyes Ultimate Dragon?? ?